As if I didn’t have enough to read already, July’s scorching book release schedule just went nuclear. 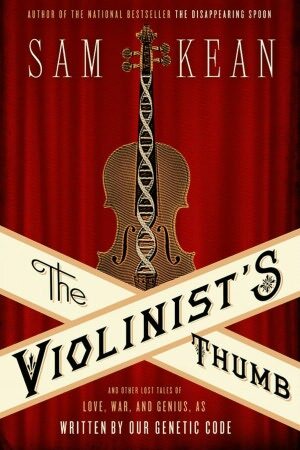 On July 17, Sam Kean’s briefly titled, The Violinist’s Thumb and Other Lost Tales of Love, War, and Genius, as Written by Our Genetic Code, hits shelves (and my Nook). Kean is a science writer as anecdotal as he is analytical, able to reveal the characters behind the clamps, condensors and graduated cylinders. His books engage you first and foremost with their stories, but Kean’s greatest talent might be his ability to make hard science accessible to non-lab rats. His previous book, The Disappearing Spoon and Other True Tales of Madness, Love, and the History of the World from the Periodic Table of the Elements, turned chemistry into compelling literature. It is easily one of the greatest books I’ve ever read (no small statement), and had this been my high school textbook, I’d have gone to graduate school for chemistry rather than English. This time, Kean reveals the secret history of DNA. I’m almost afraid to learn about the mishaps, misdeeds and happy accidents of our genetic code. If The Violinist’s Thumb is anything like his other work, the book should come with a CAUTION sticker: Likely to cause uncontrolled fits of learning and laughter. I haven’t scored a peek of the new one, but here is my review of The Disappearing Spoon. Thankfully, Sam Kean heard my plea to write a follow-up. For this reviewer, it will be the most anticipated release of the summer.